Increasing identity salience among volunteers is an approach that organizations can utilize to enhance volunteer numbers. 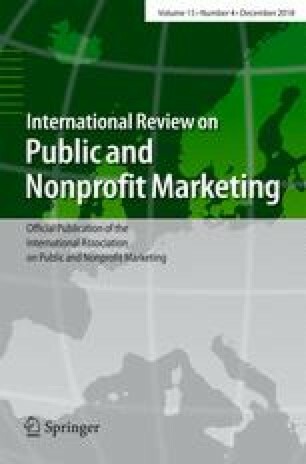 While the importance of identity salience in influencing volunteering has been recognized in the literature, most previous studies of the antecedents of identity salience have focused on personal or brand related variables which can be difficult for non-profit organizations to influence. Drawing on marketing theory, we develop a new conceptual model that considers personal, brand and service encounter variables as antecedents of identity salience. Using in-depth interviews (n = 11) and a survey (n = 433), the research expands and tests seven antecedents of identity salience. These include: personal variables (interest in the domain (art), social responsibility), service encounter variables (participation frequency, social exclusion, visibility, and experience quality) and a brand variable (organizational prestige). In the context of art galleries, social responsibility, visibility, social exclusion and organizational prestige were found to be the key drivers of identity salience. Chenhall, R. H., Hall, M., & Smith, D. (2015). Managing identity conflicts in organizations a case study of one welfare non-profit organization. Non-profit and Voluntary Sector Quarterly. https://doi.org/10.1177/0899764015597785.